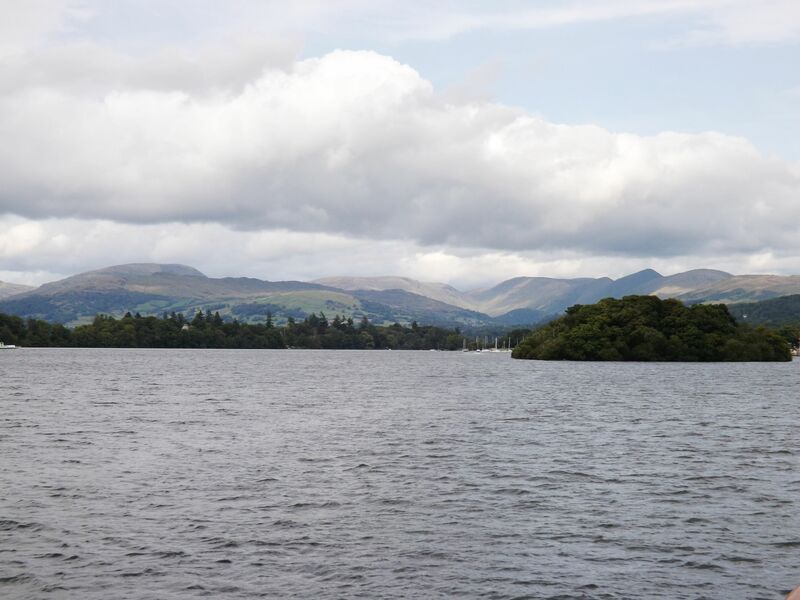 On day 5 of our Lake District holiday, we headed back to Bowness-on-Windermere to properly explore what it had to offer. After our terrible parking experience from the previous day we decided to set off really early and hopefully beat the traffic. Thankfully, our strategy paid off. We were one of the first people there in the morning and we had our pick of parking spaces. We picked up our tickets without incident. As we didn’t have a printer at the cottage I had been a little concerned that there might be an issue when we got to the ticket office, but I needn’t have worried. I showed them the reference number on my phone and we were handed our tickets. Job done, in no time flat. 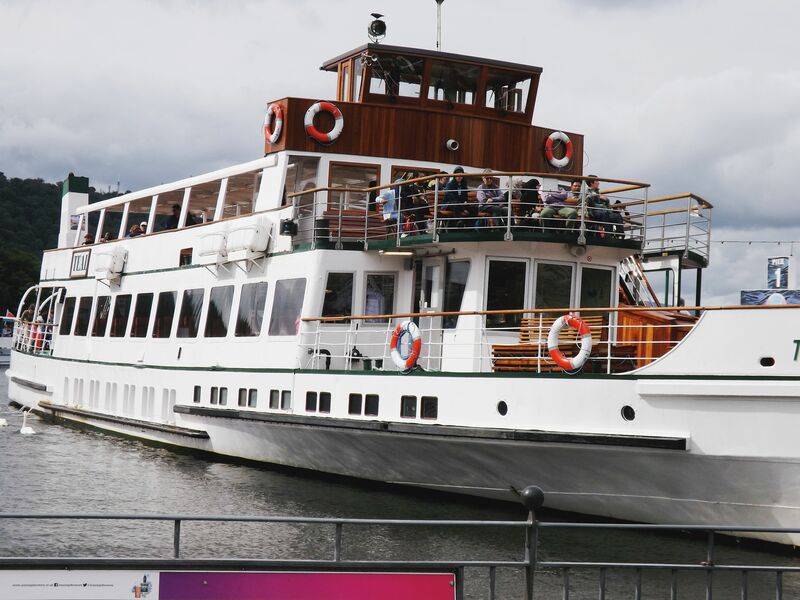 The Yellow Cruise takes you from Bowness to Lakeside, usually on one of the beautiful steamers pictured above. You could do a whole host of other journeys around the lake if you purchased the Freedom of the Lake package, but we thought one return journey would be enough for the girls. Having arrived so early, we managed to catch the first cruise of the days on Teal, one of the three steamers. Miss Mess took a while to decide where to sit, but eventually chose upstairs, under cover, but with open sides. It was quite a chilly morning and a little damp but we still had lots of fun. The journey across the lake took about 40 mins and along the way we were treated to some of the most beautiful scenery the Lake District has to offer. When we arrived in Lakeside we could see the train on the station, but we were getting hungry so decided to stop for me lunch first. We popped into the little dockside café and had a mini feast of sandwiches, sausage roll, brownies, slashes and a Starbucks Caramel latte for me! Bliss! There was also a little gift shop in the cafe, with a selection of toys and souvenirs which the girls couldn’t resist looking at. They both ended up choosing a new friend to come home with us. The Lakes Aquarium was situated right next to the dock and the train station, so luckily we didn’t have too far to go for the second part of our day out. Although Mini Mess travelled for free, she did need a ticket to enter the aquarium. We paid the extra £4.95 on the door and then we were in. 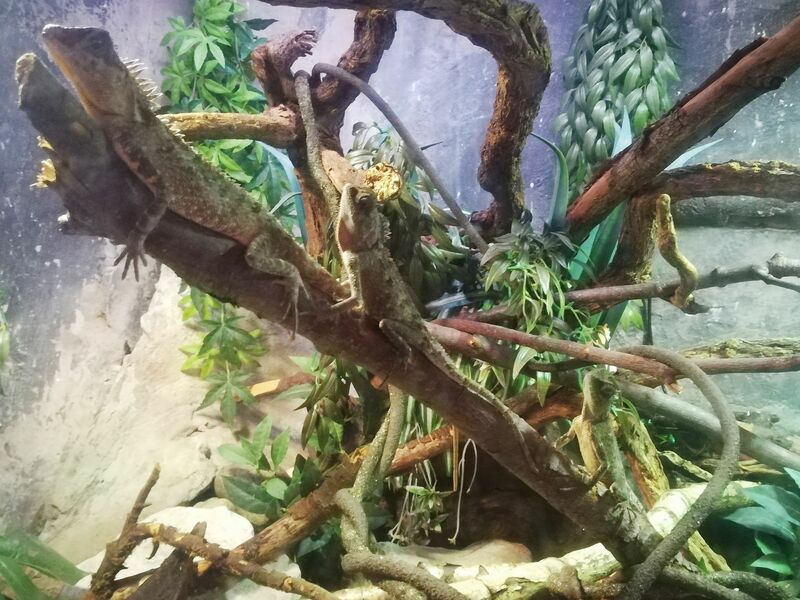 The aquarium was pretty much as you would expect, with a good variety of aquatic creatures to look at (and thankfully only one or two snakes – I never understand why aquariums need snakes!) 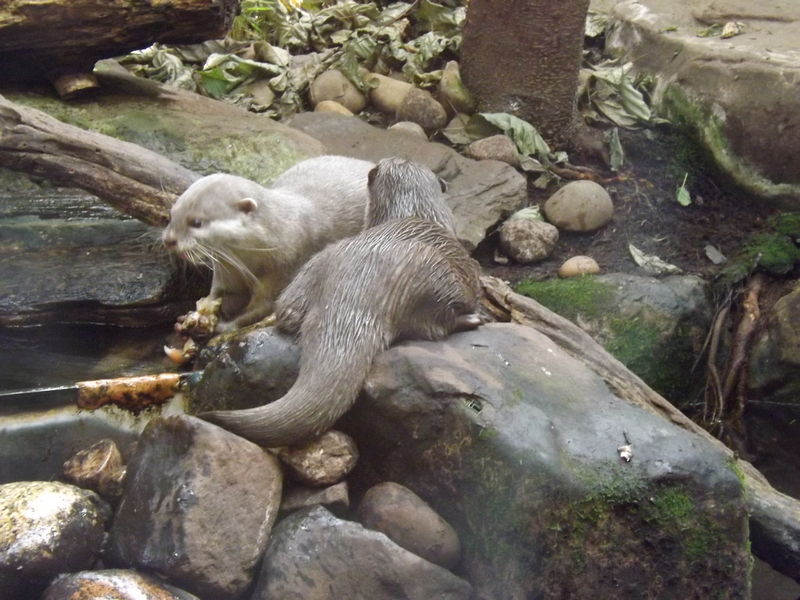 A particular hit for the whole family was the incredibly cute otters. I could have happily sat for hours watching them. I liked how informative and descriptive some of the displays were and there were plenty of interactive elements so the kids (and the grown-ups ) were learning something new as they went along. 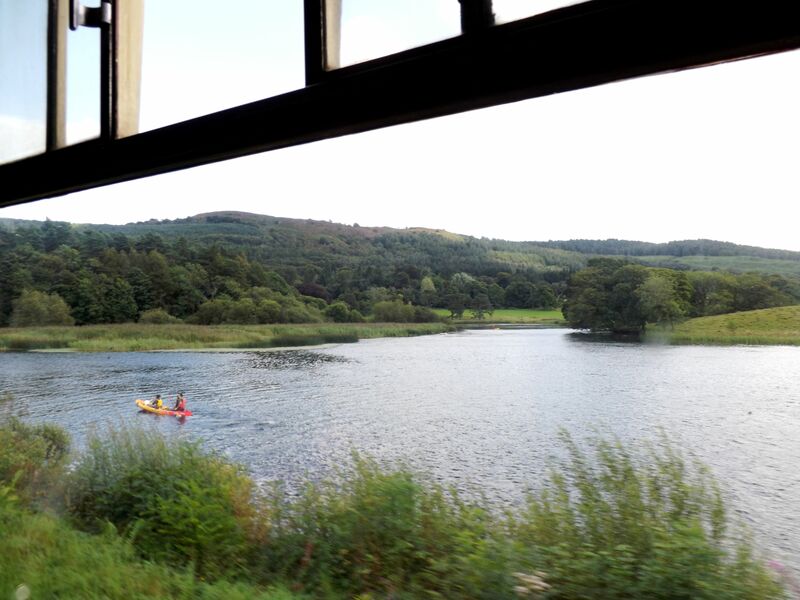 The final element of our day was a trip on a steam train from Lakeside to Haverthwaite. The journey takes about 20mins each way. On our outward journey the train was pretty full and we couldn’t get seats together. Luckily we managed to sit across the aisle from each other, opposite two other couples who were really lovely and didn’t mind the kids talking their ears off! We had planned on coming straight back once we reached the end of the line, however the girls heard an announcement that there was a playground at the other end and that was that. We disembarked and let the kids have a really good run around and play for a full hour before the next train arrived to take us back home. I was really impressed with the scheduling of the boats and the trains. Everything fell pretty seamlessly so that as we hopped of the train, the next steamer arrived and we could get on board. It was a very smoothly run operation. On our return boat ride, we decided to sit downstair, indoors, which is somewhat ironic as by now the sun had come out and it was a glorious day. Still, everyone was getting a little tired so Mr M went to the onboard refreshments stand to pick up some juice and biscuits to keep us going. Before long we were back in Bowness and in the car, heading home. We all thoroughly enjoyed our jam-packed day exploring Lake Windermere and I definitely feel like we got amazing value for money. I’d highly recommend you check out the Windermere Lake Cruises website if you’re planning a day out in the area. Thanks for watching. Only two exciting instalments left to go. 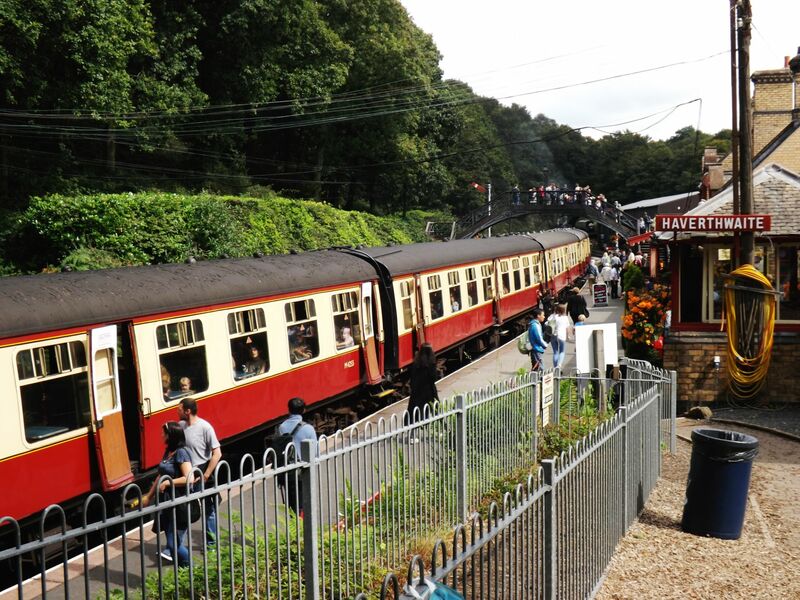 This entry was posted in Travel and tagged holiday, lake district, lake windermere, steam train, travel blogger, uk. ← Miss Mess Blogs || I met Carrie Hope Fletcher!